Teaching Blog Round Up: Thanksgiving Freebies! Hi blog hoppers, it's Diane over at TeachWithMe.com I've been having a blast designing all sorts of new November activities that I'm excited to share with you! If you're short on time, feeling a bit frazzled, and need some simple things that are ready to plug in as a center or group activity, you'll hopefully find something here that will help you out. If you do a mock-Thanksgiving feast, or thankful snack, having your students make this placemat is fun as well as educational. If you need some sanity, this is also a quick and quiet activity to do an hour before dismissal on Wednesday before the holiday. I've included a sample so you have an answer key. Click on the link to grab the Thanksgiving placemat FREEBIE. Need some writing prompts? As an alternative to the "I'm thankful for…" turkey feathers, I designed a Thankful Tree. Here you can also cover the seasons. Each season has its own colored tree top. i.e. fall is orange, winter is white etc. The last page is an opportunity for students to write more things that they are thankful for. Encourage kiddo's to incorporate adjectives and have them underline them in their rough drafts, so they know they've done so. Add a few stickers on the tree tops + their school photo in the hollow of the tree for that finishing touch. For lots more writing activities I think you'll enjoy the Pilgrim Children Packet. 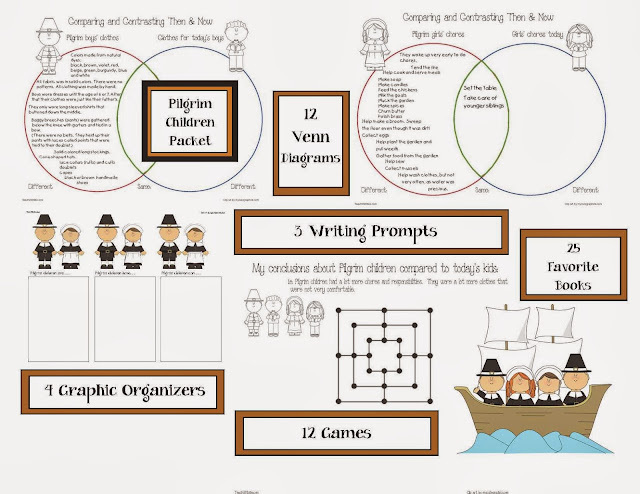 It's chock full of graphic organizers, Venn diagrams, writing prompts and a dozen colonial games that are simple, quick and easy to implement, for some educationally fun gross motor activities. I did 30+ hours of research to find out about Pilgrim children and have included these interesting facts in partially-filled in Venn diagrams. I've also included blank ones, as a quick way to assess comprehension. I learned so many new things and hope you do too! Click on the link to grab this FREEBIE. 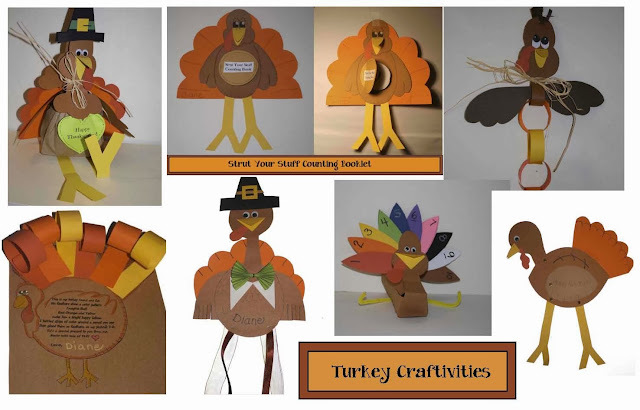 Finally, I know days are busy and crammed full of CCSS, but it's nice if you can squeeze in some time for a turkey "craftivity." 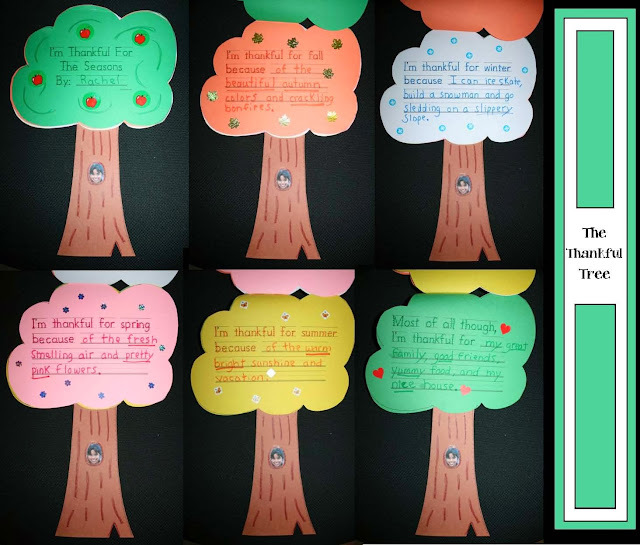 I use quick crafts as a motivational tool to get students down to business and stay focused. When they complete their work they can transition to these independent choices that are super for fine motor-practice. It's amazing how this incentive helps keep little ones on task. I try to design things that also cover simple standards. Click on the link for all of these sweet turkey FREEBIES. That's it for now, 'til I pop back December 19th. My life flies by so fast I'm sure that's just a heartbeat away. I hope you and yours are truly blessed this Thanksgiving and always.